VN GAAP which is more than well-known by name Vietnamese Accounting Standards and System, is not one set of accounting principles but dispersed in laws and regulations. VN GAAP consists of number legal documents including accounting law, accounting standards (VAS) and its interpretation, financial management regime, accounting regime and guidance on accounting treatment of specific transactions etc. Accounting law issued by the National Assembly, is the legal framework for the accounting profession. 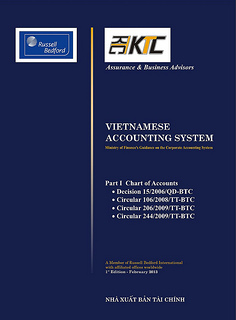 Vietnamese Accounting Standards are issued in compliance with International Financial Reporting Standards. So far, twenty-six standards are issued. VAS interpretation is further guidance for implementation of the standards in which prescribed accounting treatments are provided. Financial management regime is imposed on particular sectors or industries. The regime issued is for the purpose of government's examination. The legal document is tax driven and defines the “norm” for expenditures and revenues of the entities and their distributed profit. At present, there are two main accounting regimes. One is for business corporation regulated in Decision 15/2006/QD-BTC dated March 20, 2006 and the other regulated in Decision 479/2004/QD-NHNN dated April 29, 2004 is for the credit institution.